Sometimes you just need a little privacy online. You wouldn't probably admit to engaging in some online activity that you don't want others to see, especially if they use the same computer you do, after you...or if you share a computer. That list of others includes your spouse or significant other, your children, your boss or the person who uses the same computer after you at the library. This doesn't necessarily mean your online activity is R-rated or worse: it simply means that sometimes keeping things a secret from your computer-mates would be preferred. You're planning a surprise trip for your anniversary and you want to keep the planning hidden for your spouse. If you two share a computer from time to time, you don't want travel sites listed in the History menu where she might stumble upon them. Or perhaps you're a big fan of sports and health fitness and you want to see what the models in the latest Swimsuit edition look like. (Right.) Oh, and you prefer your kids (and wife) didn't know you browsed the site. That's when turning on the Private Browsing option in a browser before you start diving into certain websites comes in handy. 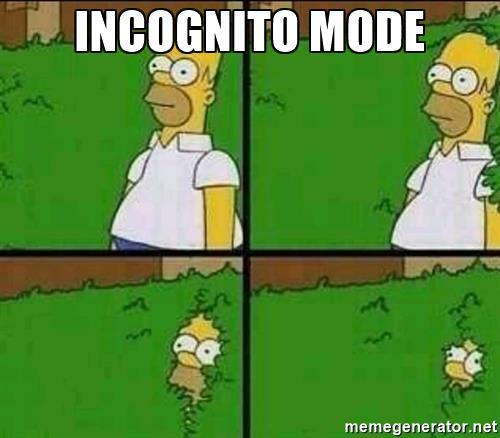 In some circles, Private Browsing on the Internet is called using "incognito mode." This article looks at what incognito mode is and isn't. To learn about or use Private Browsing, open your browser application (Chrome, Safari, Firefox, etc. ), go to the File drag-down menu up top and select New Private Window. That's all there is to it. Now you see it. No, you didn't. Incognito mode is probably not the best term to describe the Privacy feature that all browsers offer, because you're not hiding your identity in any way—you're just not leaving a trail of what you're doing online. As you know, a browser, for your convenience, keeps tab of your recent Website viewing—it's all there in your History tab—for your convenience, but also for anyone to stumble across and get shocked or surprised by. Privacy mode is the simple low-tech solution. It lets you browse the Internet like you always do, just without having your activity officially logged in your browser History. Book research at the public library. Let's say you're interested in learning about hemorrhoids and need to do some research...for a friend. You consider going into a public library to check out (and bring home) several books on the topic. The librarian who helped you at the check-out counter. Any other librarian who has access to the database. The person behind you in line who notices the books you're checking out. Go into the library and find the books on hemorrhoids. Don't check them out to take them home. Find a desk in a quiet corner and read the books while you're there. Return the books to the bookshelf when you're done. Online research in incognito mode. If you were to go on the computer in your apartment, for instance, to do your hemorrhoid research online, all your own browser search history and website visits would be recorded on the browser's history—all available to view by a snooping roommate. By going into incognito mode on your computer—by opening a Private Window (or two) in your browser, none of that history will be logged in your browser. And if you remember to close all the website pages on screen, the next person on the same computer will not know what websites your visited. Your browsing remained private to the public. What incognito mode is not. It's not 100% private. Not even close. Private Browsing doesn't make you anonymous on the Internet. Your Internet service provider, employer, or the sites themselves can still track what pages you visit. Private Browsing also doesn't protect you from keyloggers or spyware that may be installed on your computer. If you want to go on the Internet and stay anonymous, you'll need to never use your real name in conversation, never reveal what city you're in, and use a Virtual Private Network (VPN), which will prevent other Internet users (plus marketers and eavesdroppers) from being able to trace your online activity to your real IP address. But if all you need to do is hide your plans for a golf weekend at Pebble Beach from your wife (who isn't invited), a simple Private Window and an escape into incognito mode may be all you need.